The Spectre et al. could sell comic books on their own, then putting them all in one story ought to sell even more comics. If that's the case, it's hard to guess what might have been on their minds a year later, when they launched The Seven Soldiers of Victory (aka Law's Legionnaires). Its members — The Crimson Avenger, The Star-Spangled Kid, Green Arrow, Vigilante, The Shining Knight, and their respective sidekicks — were far from the company's headliners. Only two of them were appearing regularly on a comic book cover, and of the two, one was a couple of months away from being ousted from that position by a more popular character. Right from the start, the group was nothing but a bunch of second-stringers. The group had only 14 adventures (with no roster changes) before Leading Comics was converted to funny animals, with its Summer, 1945 issue. 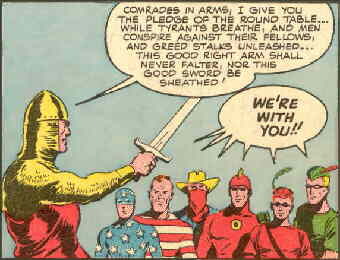 It went on for another ten years in that format, and even had the obscure distinction of introducing Otto Feuer's Peter Porkchops (later a member of Captain Carrot's Zoo Crew) in its 23rd issue — but The Seven Soldiers of Victory, as a team, were gone for good. Despite that brief moment in the sun, they're still not stars and probably never will be. But DC very seldom turns loose of a superhero. Text ©2001-07 Donald D. Markstein. Art © DC Comics.